Thailand's capital city, Bangkok, is also known as the City Of Angels. The moniker is well deserved, and it fits this ethereal metropolis that bustles with eclectic nightlife, amazing shopping and some of the best food in Southeast Asia. If Bangkok isn't on your "to visit" list, it should be! It is one of the gems of Southeast Asia; a city like no other in the region that's equal parts authentic and innovative, with an exciting edge and an intoxicating culture! When you visit Bangkok, remember that there's one particular area that has captured the hearts of locals and visitors alike, Sukhumvit Soi 20. Soi, meaning "street" in Thai, refers to the streets that run off Sukhumvit, a major artery in the city. Sukhumvit is also home to one of the BTS lines. The second BTS line, Silom, is easily accessible through central Siam station from Sukhumvit Soi 20. The BTS is a sky train that runs at regular intervals throughout the busier parts of the city. It's a convenient and easy way to get around, and often quicker than grabbing a taxi on Bangkok's clogged streets. Sukhumvit Soi 20 is right between the popular Phrom Phong and Asok BTS stations, making it easily accessible from either. This area of the city is full of amazing restaurants and great street food. You can't walk down the street without smelling some incredible dishes. If you're feeling adventurous, pull up a plastic chair alongside the locals and get a bowl of Thailand's famous noodle soup and a cold Chang beer. For those who like a more formal experience, there are plenty of fine dining options in the area. Terminal 21, one of Bangkok's premier shopping malls, is a short walk from Soi 20. Not only does it have some fantastic shopping, it's also home to one of Bangkok's best-kept secrets; a food court featuring some of the best dishes you'll eat, for a fraction of what you would pay back home. Dining options aren't limited to traditional Thai favourites either. Soi 20 is full of international cuisine crafted by world-renowned chefs and bursting with flavor and authenticity! Whether you're craving a flame grilled burger, traditional German fare, or Japanese food, Soi 20 is a great place to go. Don't forget to snack on some Bangkok originals though. You'll never find better mango and sticky rice anywhere in the world! Many people prefer to graze as they take in the sights of this amazing part of the city. You'll find fresh fruit vendors dotted all over the street, selling everything from dragon fruit to pineapple, to the freshest mango you've ever tasted. Iced coffee is a speciality in Bangkok, and it's prepared right in front of you. Locals use liberal amounts of sweetened condensed milk and Nescafe. If you want yours a little less sweet, just tell them "Mai Wan", or without sugar. Sausages and fried chicken are also plentiful in this area! The fried chicken is fresh, delicious and hot, and you can eat it right on the street. The sausages come in a number of different varieties, from savoury to the slightly sweeter Northern variety. One thing is for certain; a trip around Sukhumvit Soi 20 is a culinary trip around Thailand in general! If you love shopping, Soi 20 is where you need to be. 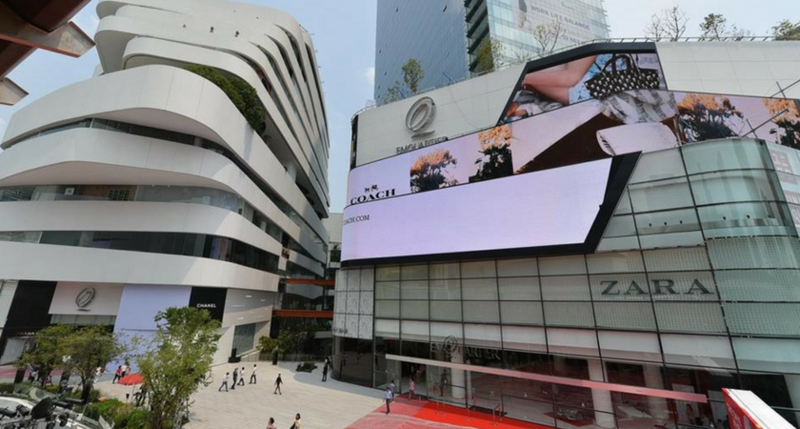 Terminal 21 and the luxurious Em Quartier are right nearby and easily accessible by walking. Bangkok is famous for its fine shopping. You'll find stores like Prada in these malls. Even if you don't have the cash to burn, take a walk through the sprawling malls. You can grab an iced coffee, get out of the steaming Bangkok sun and do some wishful window shopping. These malls are enormous, so you'll get quite a workout in simply by strolling through the corridors. Their food courts and restaurants are second to none so make sure you grab something to eat! The architecture of these malls is second to none as well. Terminal 21 is interesting because it's separated into different levels, with each level representing a different country. Even if you're not planning on spending money, you should take a walk around the levels and marvel at the creative decor. If you're more interested in buying from vendors, Soi 20 is a perfect place to go, because there are plenty of shop owners and vendors who spread out their wares on the sidewalk when the sun goes down. You can spend hours wandering through their stalls and buying souvenirs that are beautiful, unique and will be cherished by your friends and family back home! Most people opt for a little of both; they visit the designer stores in the malls near Sukhumvit Soi 20 and then also stroll through the street vendors to pick up additional items. You could easily spend a day between Terminal 21 and Em Quartier. Bangkok is famous for its exceptional nightlife, and Sukhumvit Soi 20 is right in the middle of the action! This area is full of classy rooftop bars where you can catch a glimpse of the breathtaking Bangkok skyline while sampling a designer cocktail. Many of these places have a dress code, so make sure you dress to impress and get ready for a night to remember! Bangkok's rooftop bars are really popular so if you're going on the weekend, get there a little bit early to grab a seat before it starts to fill up. On most nights you'll see the sprawling tapestry of downtown Bangkok unfolding before your eyes after the sun goes down! Tremendous! This area is also infamous for Soi Cowboy, a party district located near Terminal 21. Soi Cowboy gets something of a bad reputation, but it also has some great live music venues and cheap cocktails. It's not a bad place to spend a few hours people watching and drinking a cold Leo! You can also find tons of pubs in this area. Bangkok is full of expats from all over the world, and many of them have recreated their favourite bars and pubs from their home countries right in the City of Angels. These pubs are always available to serve up a cold pint or some authentic pub fare. Simply stroll down Sukhumvit Soi 20 and you'll find any number of dark wood panelled old English style pubs. Pop in for some great conversation and a pint or two. These places are a nice little oasis and a reminder of back home. On the other hand, you can find any number of local places dotted along this area also. These places often have live music and drink specials. Even if you don't speak Thai, you'll be welcome to join the locals for a beer or two. If you're lucky, they might even share their som tom (spicy papaya salad) with you! This area is also known for some great live comedy at the Bangkok Comedy Club, where a minimal cover charge gets you access to some of Bangkok's finest comedians. Shows are performed in English and always packed, so make sure you arrive early. Comedy shows are a unique and refreshing way to spend the evening, and you won't want to miss one. The best part is that the comedians are often long-term travellers or expats who have a unique take on the city. You'll find their insights interesting and be sure to laugh a ton during your evening! Thai massage is known around the world as a relaxing and restorative activity that leaves you feeling refreshed and rejuvenated. It's also extremely cheap in the City of Angels. What would cost you at least $60 back home can be had for a mere $3-$6 and the quality will probably be better! You'll want to take advantage of the plethora of massage places near Sukhumvit Soi 20! Also, if you're in need of a haircut, pedicure, manicure or any other spa services, Bangkok is the place to do it. Not only are these services comparably cheaper, you won't be skimping on quality. Bangkok is known for being a hub for beauty treatments. Why not pamper yourself for a low cost? Many places accept walk-ins so you don't need to book in advance. Simply set aside a few hours to make yourself beautiful! Sukhumvit Soi 20 is located right between the Phrom Phong and Asok BTS stations, making it the ideal place to make your home base in Bangkok. You can easily get to any popular tourist locations from this spot. It's also very safe, being located in a relatively higher end area where tourists flock. You will be safe coming back even late at night. Taking the BTS is easy! Simply walk up Sukhumvit Soi 20 towards the Asok or Phrom Phong BTS stations (each one is about 10 minutes from the foot of the street) and hop on the BTS in the direction you want to go in. Siam, the central station popular for it's Siam Paragon shopping mall, is located only a few BTS stations down. Chatuchak Market, the largest open-air market in Bangkok and a must-see for any visitors, is only about 20 minutes away by BTS. For visitors who want to see the bar that has been made famous by "The Hangover 2", the Sukhumvit BTS will take you to the Silom BTS line, which dovetails with Sukhumvit at Siam. The bar, called LaBua, is right off the Silom line. The BTS will also take you to Bangkok's bus stations and minibus stations, where you can take any number of day trips to areas outside the city. You can also get to the train station, where you'll be able to jump on an authentic Thai train heading north towards the ancient capital of Ayutthaya or "Monkey City" Lopburi! Ultimately, at the end of your adventure, you can head back to Sukhumvit Soi 20 and enjoy a relaxing evening sipping a cocktail at the rooftop bar or doing some last minute shopping. The location is really perfect for exploring all of Bangkok and the surrounding areas, while still having a great home back to come back to. If Bangkok, Thailand's City of Angels, isn't on your list to visit it needs to be. There's no better spot to stay in the Thai capital than Sukhumvit Soi 20 and the new akyra Sukhumvit Bangkok Hotel. Centrally located, full of amazing dining options and bursting with premier shopping, this area is arguably one of the best in the city. With nightlife options that range from local flavor to rooftop bars, you won't be bored for a second!